The word “discipline” has many slightly different meanings, but they all stem from the same concept – that of learning to follow a prescribed path or set of rules. It can refer to the punishment delivered for not following the rules, or the mastery of a field of study, but ultimately the core of the definition, and what I am interested in here, is the building of self-control in order to make ones actions consistent with ones values. This kind of discipline is central to the purpose of religion, in general. In fact, I would argue that discipline is a defining characteristic of religions, in that the degree to which they embrace or eschew discipline and the object of the discipline provides substantial insight into the nature of nearly any religion. This is certainly true for the LDS Church. The LDS Church embraces a high ideal when it comes to discipline. There are several scriptures that set this ideal. First, there is the command to be perfect, as stated in Matt. 5:48 and reiterated in 3 Nephi 12:48. On top of that, we believe that we will be judged by our thoughts, words and deeds. (Mosiah 4:30) So, not only should our behavior be perfect, but also our speech and even our thoughts! Obviously, that’s not technically possible — at least not for an entire lifetime, and for most of us, even a perfect day is far fetched. Nevertheless, I am grateful for that standard. It means that we will always be able to be a little better, constantly improving ourselves. He wants us to be perfect. More importantly, God promises to help us achieve the things he commands us. (See 1 Cor 10:13 and 1 Nephi 3:7) In this pursuit, of utmost importance is the Atonement that makes up for all of the mistakes along the way, and makes true progress possible. Close behind in importance is the guidance, structure and assistance He provides for us to gain that discipline of body and mind. That’s what perfection is: discipline. It is being entirely consistent with a perfect model: God and Christ. When we desire to gain discipline in anything, we start by first learning the rules, often selecting a model or teacher to guide your progress. When it comes to Christianity, the model is obvious, but unfortunately, we don’t have the ability to directly observe Christ. So, we must resort to the scriptures and other religious teachers. As most religious teachers gained their knowledge the same way, the words of Christ and his prophets in the scriptures are the best way to learn His will for us. And so, from an early age, young members of the LDS Church are encouraged to read the scriptures daily. Of course, discipline can’t be said truly to begin until you do something with what you’ve learned. We start out following the rules because they are the rules, in other words, through obedience. We try to follow the rules we’re given and the examples of our models and teachers (remember, I’m talking about those who desire to learn discipline). As we make a regular practice of following rules, we often gain an appreciation for and an understanding of the rules. We also start to form habits. From an outside perspective, this may achieve a primary goal of the discipline, but there is a danger in stopping here. Ultimately if we wish to master a disipline, we need to fully understand the reasons for the rules, so that we can extrapolate necessary or desired behavior in situations where the rules may be ambiguous or insufficient. In order to make this extrapolation a clear understanding of both the model and the rules is necessary. With this understanding, we are able to act in a way that effectively aligns us with the model, but where our adherence to the rules happens not because they are rules but because we understand how they help us to obtain the perfection we desire. As human beings, our capacity for error is literally infinite. We cannot say that even mastery is the end of the road in terms of progression. We must continue to do one thing that we need to do throughout this process — constantly guard against and correct deviations from the model as we discover them or they are pointed out to us. We must both accept correction, and self-correct every step of the way. When we apply this processes to attain a certain level of discipline within a religion we call it discipleship. Religions generally aim to make all of their followers disciples. This is certainly true in the LDS Church. Many of the teachings and practices recommended by the Church serve to foster such discipline. The teachings are certainly not unique to the LDS Church, and using them in any religion or even outside any religion at all, will also result in increased discipline. The first is daily prayer. We are encouraged from a young age to pray over all parts of our lives. In the morning, at night, at meals, before and after meetings, even before and after sporting or cultural events. In fact, we are encouraged to pray always. 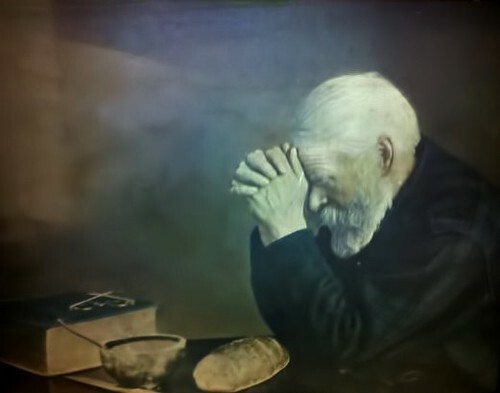 One benefit of prayer, is that it serves to re-focus us on what is important, and provides a time for us to examine our lives and identify where we need to make corrections. We are also encouraged to study the scriptures daily. We must know Christ in order to use him as our model, and there is no better way to know him than through scripture study and prayer. Every week at church, we take the sacrament. For us, this is a time to renew our covenants (entered at baptism) to try to live as He taught and to take His name upon us – to be true Christians. We need these weekly opportunities to re-commit ourselves, to move past last weeks failings and focus on the good we can do in the coming week. The Church has also designated the first Sunday of every month (though it is moved on occasion) as “Fast Sunday,” and encourages us to fast for 24 hours (or as much as we are able), and to give the money we would have spent to the fund the Church uses to provide food, clothing, housing and other critical assistance to members of the Church (and community, at times) in need. Fasting itself is one of the best ways to learn discipline. Through it, we learn that our spirits/minds can be more powerful than our bodies. That is the key to true discipline. If we allow our human impulses and urges to govern our behavior, or worse, believe that we have no power to control those impulses, discipline will always be beyond our grasp. These tools are the basics for putting us on a path to discipline and discipleship. They allow us to tackle the more advanced, abstract concepts of self-control, integrity and sacrifice — all of which are ways in which we practice discipline. We know we will always be imperfect. The great thing about discipline is that you CAN be perfect for short periods of time in some things. We are not required to be perfect to attain salvation. We are required to work on becoming more perfect. We call it “eternal progression.” When we are making progress, we are on the path. When we are helping others, we are on the path. When we are learning, we are on the path. If we get off the path, Christ is always there to help us back onto the path. Discipline is an interesting thing. No matter how disciplined or skilled we are in a discipline, maintaining that level of discipline is a daily effort. Daily effort + daily discipline + eternal progression = perfection. I suspect one of the reasons religion has maintained a powerful influence on humankind over the past several millenia is that it usually comes with some answer to the question, “what happens when we die?” This age-old question is always there, nagging. As human beings, we like being prepared. Not knowing what will happen makes that preparation extremely difficult. In many ways, the lack of a sufficient answer is a driver of civilization – motivating activities from the planting of crops to the purchase of insurance. There is nothing that is both so universally influential and poorly understood as our passing from this life. The answer to this question, according to most religions, is some kind of existence after death. Many non-religous people would claim this is wishful thinking. Some people have claimed “near-death” experiences. At least one scientist has tried to detect spirits leaving the dying. Ultimately, there is little convincing proof of what happens, leading most to act according to their hopes and fears of what might be. Many a philanthropist, for instance, has been motivated by a fear that only the influence they have on others will last beyond death. Specific beliefs about the afterlife are rare. In contrast, LDS doctrine surrounding our continued existence after death is quite specific on many points. Not only do we believe that our spirits continue to exist, but we have some very specific beliefs about the nature of “heaven” and “hell” as well as the overarching trajectory and substance of how we continue to exist. Within the context of the Plan of Salvation, death is merely a transition from one part of our existence to another. Our spirits, which are eternal, depart from our bodies at death. Our consciousness, our individual personalities and psyches are contained within our spirit. So, in essence, we are the same people after death as we are in life, only without a body. We will retain our identities, our knowledge, our preferences, and even our senses of humor. As spirits are made up of matter, we also continue to have a form and location. Immediately after death, we return to the spirit world which we left to come to this mortal life. There we will be met by our loved ones who have passed before us, and more importantly, by our Savior. This initial meeting is a homecoming — a loving welcome. After this there is a period of waiting. That is to say that this is not our end state. While we are waiting, we’ll have time to contemplate the lives we lived and interact with some of those we may have affected with our choices in life, for good or ill. Some might consider this period heaven, and others might consider it hell. In LDS terminology, this is Paradise and Spirit Prison. Those who have an understanding of the Gospel will use this time to teach those who do not, in order to prepare them for what is to come. This effort is led and organized by Christ, himself. All who have died without the opportunity to learn of the Gospel will have a chance to hear it and accept the covenants and redemption it provides at that point. For those who choose this path, baptism is still a requirement. Because this is a physical ordinance requiring a body, living members of the LDS Church perform proxy baptisms for the dead. Some might wonder why, if one could accept Jesus after we die, someone wouldn’t just opt to live their life as they please and repent in the afterlife. There are several ways to answer that question. In my mind, the most compelling reason is that the end goal isn’t simple salvation, but rather becoming like God. This requires dramatic improvement from our current state. Every choice that we make, either in this life or the next, either brings us closer to God or further from Him and shapes our personality accordingly. The farther we are from God, the harder it will be to return to Him when we decide to make that change. Those who delay their repentance hurt themselves more than anyone else. Although all will be resurrected, it will happen at different times for different people. Those who were righteous in this life will be resurrected as part of the “first” resurrection. This began with the Resurrection of Christ, after which “the graves were opened; and many bodies of the saints which slept arose.” (Matt. 27:52) Righteous people who died before Jesus were resurrected at that time. The next wave of this first resurrection will occur at Christ’s Second Coming, and will continue through His millennial reign. The “second” resurrection will happen at the end of that reign, and all remaining people will be resurrected at that time. After we are resurrected, the next step in the Plan is the Final Judgement. I will leave this, and a discussion of the results of that judgement for a separate final post. I feel it’s important to point out here that while I believe all of this partly because it is what is taught by the Church, I would not likely believe such detail if it weren’t all consistent with what the scriptures teach about the character of God and with the direct teachings related to the afterlife. I choose to believe in this because it makes sense with the other religious truths I embrace. It shows the love of God for us and His desire for all of His children who will to return to Him. There may be little to no support from the body of scientific truth to support this belief, but ultimately that doesn’t matter, as there’s little that science could add one way or the other. I choose to have hope in this outcome. I hope some of you also find it comforting to imagine that it could be this way.